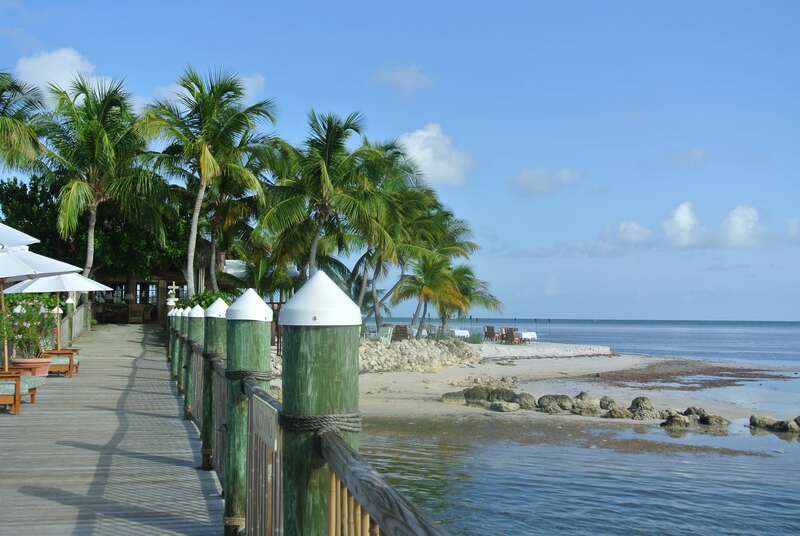 Little Palm Island Resort & Spa is a exclusive private island resort located 28 miles east of Key West in the Florida Keys, with thirty thatched-roof oceanfront bungalow suites. The entire island is only five acres. It was first inhabited by a fellow named Newton Munson in the 1920’s who planted some 250 Jamaican coconut palms. More than 20 years later, Little Palm opened as a resort. In 1995 it was sold to Patrick Colee and was made a part of the Noble House Hotels & Resorts. Little Palm Resort & Spa is open to guests age 16 and over. It mostly attracts couples looking for a romantic escape like us. The island houses a ten-slip marina, 28 one-bedroom bungalows, and two grand suites. Each of these luxurious, thatched-roof huts is named for a local bird, and each is nestled discreetly among Little Palm’s, well, palms. Most bungalows have indoor and outdoor showers, private verandahs, chandeliers, and ocean views. From the moment you park your car in Little Torch Key you are greeted by the warm friendly staff member with a nice rum drink. After a short 15 minute boat ride on “The Truman” the islands private boat, you arrive in your own little fantasy island. It’s name the Truman because of the frequent visits by President Harry Truman to the island. Little Palm Island is only accessible by boat or seaplane. If you prefer to pull up in your private yacht. The marina can accommodate yachts up to 120 feet. Upon arriving the islands dock the staff takes you on a short tour of the grounds and explains the rules on the island. No cell phones are allowed anywhere in the island except your bungalow. The bungalows are very personal with your last name displayed in the front. You walk into the living room area with a welcoming bottle of champagne and fresh fruit awaiting your arrival. The bathroom is spacious with a his/hers section. The bedroom has a very high king size canopy bed with requires a step stool just to climb on or off it. The bedding is extremely comfortable. You can spend the day lounging around the pool enjoying a cool cocktail, admiring the ocean on the beach, getting a relaxing massage in the spa, taking a sea kayak out, snorkeling or sailing. The food service is exceptional and the menu changes every night. The view of the sunset is breathtaking as you sit and enjoy dinner on the beach. If you’re lucky you’ll see a few of the endangered Key Deer roaming around the property. Little Palm Island is a place for leisure and relaxation. The bungalows nightly rate ranges from $990- $2200 a night. The private bungalows have no phones, or TV’s in any of the rooms. Wi-Fi is limited to your bungalow. Although, you can get cell phone service and Wi-Fi in most of the island. Signs are posted all over the island to remind guests to refrain from using mobile devices anywhere on the island, including the beach other than in their private bungalow. Living in Florida everyone knows that in the summer and early fall especially in the florida keys, there are mosquitos. Be prepared to bring with you bug spray and cortisone cream. Only three words come to mind when I describe our weekend at Little Palm Island Resort & Spa “Romantic, Luxurious, Getaway” We loved our weekend getaway at Little Palm Island, and hope to return again soon. This looks like a wonderful, romantic getaway…and peaceful! I love the size of the island, no crowds. My husband and I tried to spot a key deer when we were on some of the islands near Key West, but no luck. That’s a shame you didn’t see any Key Deer. The one in the picture above came right up to me when I was lying by the pool. It’s a very tranquil feeling with so few people on the island which is what I enjoyed the most. That looks wonderful, but wayyyy out my price range! 😀 Thanks for linking up to the #SundayTraveler! It’s not cheap that’s for sure, but worth every penny. Thanks for sharing my post. wow! This place looks amazing! Beyond my budget but nonetheless I can still dream. Bianca, if you’re ever looking to splurge on a vacation this is the place to go. You certainly feel like you’re in a dream at this island. Nina, dreams do come true sometimes. They did for me that weekend. What an idyllic place to retreat to for some rest and relaxation. Just looking at the photos and reading your descriptions is making me more stress-free. Thanks Michele, It was a very relaxing weekend for my husband and I. Especially, not being able to use our electronic devices around the property was a plus. What a beautiful island. It sounds like a perfect romantic getaway. And I love no phone policy (or reminders). Otherwise it wouldn’t be relaxing. Gorgeous photos! Thanks Frank! Even though you have no TV’s in your room, and are a bit isolated with the outside world it’s perfect. The island has a lot of activities to keep you entertained. Looks fantastic! I keep thinking I should add US beaches to my blog, right now only cover Mexico and the Caribbean, some great places especially in the Keys. Thanks for sharing! Thanks Sarah for stopping by. We have a lot of beautiful beaches in the U.S, especially Florida where I live. I’m heading to the Caribbean (Cuba) this weekend. Have you been to Cuba? Looks fun and a great place for a vacation! But man that is out of my budget unfortunately! Hi Samantha! Yes, it’s a bit pricey but worth every penny. It’s a fantastic couples getaway vacation. A place to reconnect with each other. That definitely looks luxurious – and relaxing! I love the little deer – I had no idea that there were deer on the Florida Keys! Hi Jess! The Key Deer is on the endangered species list. It’s great to see them roaming around the island free. Little Palm Island is such a wonderfully romantic get-away destination. Living in Florida all our lives we have always dreamed of visited one day. After reading your post and seeing your pictures, it seems that time may be near! Thanks so much for sharing, it looks like you both had a great time! Hi Barbara, I hope to return someday in the near future. It was truly a very memorable experience for us. I hope you get a chance to go. I have read so many wonderful things about Little Palm Island. Really enjoyed your trip report on your stay there. The island looks like it belongs in the Pacific Ocean… hard to believe that it’s part of FL. WOW! It’s soooooo beautiful! I’m pretty sure you had a great time there! Yes, it’s an amazing place to unwind!